Back in March, I published what is probably the most optimistic edition of Tales from the Dev Side I have gotten yet. 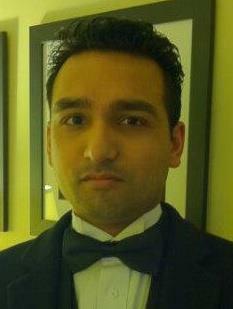 Mr. Shahed Chowdhuri is the developer of Angry Zombie Ninja Cats, a game that I boiled in oil back in November. He’s also the creator of the XBLIG Sales Data Analyzer, which has been well received among his peers. He’s also one of the most gosh-darned nice guys in the community, and his first editorial on here about gaining community acceptance was cited as being inspirational to newcomers on the Xbox Live Indie Game scene. Now, Mr. Shahed has a different, yet still insanely chirpy and upbeat message to share with everyone: success is what you make of it. With Indie developers appearing (and disappearing) faster than you can say “game over”, there is no shortage of Indie games flooding every corner of the market. From the PC to your favorite smart phone/tablet, from the Xbox 360 to the upcoming PlayStation Mobile games, Indie games are everywhere. 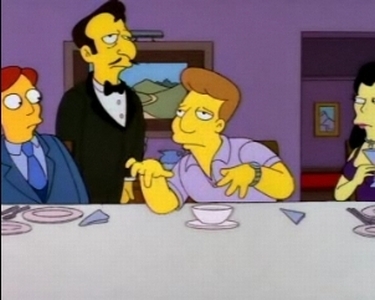 There’s even talk about a new console named Ouya, which will supposedly offer free-to-play games for your TV. It raised a million bucks on its first day on KickStarter, even as naysayers are pointing out its flaws. For established indie developers, churning out yet another anticipated sequel virtually guarantees millions in the bank. But, for aspiring developers, every new game may mean months of work with no success. Back to Ramen noodles! But what does success really mean for an Indie developer? Is it a 4-star rating? Or is it thousands in sales? Or is it just breaking even and making a profit? Instead of answering these questions directly, let me offer two pieces of advice. Don’t let others define your success. Understand what others have to say, and why they’re saying it. Don’t try to re-create someone else’s success. Follow your own path. It also helps if you dress like a boss. Let’s say you’ve just released your first game, and you’ve learned a lot from your experience. You may not have sold very many copies, but you’ve learned enough about game programming and the industry to do better next time. If you have dismal ratings and horrid graphics, most gamers will shy away from your game. They may never have the chance to experience your game, even if you feel that the gameplay makes it worth playing. This may discourage many Indie developers from making a second game. However, there is a different way of looking at it: don’t simply look at your game as a miserable failure. Learn from your mistakes, and read between the lines of what others have to say. What can you improve in a future update? Does it make sense to build a better sequel? A completely different game, perhaps? You may not have been successful at releasing a hit game, but you were at least successful in completing a game. That is a lot better than many developers who give up before releasing their first game. If you are an Indie game developer, you are most likely a full-time software developer at your day job. Either that, or you have the ability to get a new job as a programmer. Use your game-development experience to bring something useful to the workplace. Get out there and meet other local developers. Attend conferences and join user groups. Build a website and share your work. Spread the word through social channels. The more you exchange information with others, the more you will learn. You will eventually find your niche and start to excel at it. Whether your expertise lies in tap-tap games on iPhone or Minecraft lookalikes on Xbox 360, only you can determine this path. Reflecting on my own rollercoaster indie experience, I have to mention that I started off with 2 simple games. My first game came about one evening after I read “Learning XNA 4.0”, while my second game was built in two weeks, on top of the Platformer Starter Kit. Both games spent weeks in playtesting and peer review before being released. 2D Math Panic remained at 3 stars on Xbox Live Indie Games, while Angry Zombie Ninja Cats did a little better at 3.5 stars after bouncing back and forth between 3 and 4 stars. Both were profitable, since I had no expenses except for my $99 annual fee. But neither game has the looks or the charm to write home about. But what followed was what redefined my success in the world of Indie games. Fortunately, my contributions to the .NET community were recognized at work. I was asked to put together a presentation on XNA for my colleagues, and I have also been working on a prototype for Kinect in the Workplace. Plus, it was a huge bonus to be able to attend Microsoft conferences for free, from the inaugural Security Development Conference in Washington DC in May to the annual TechEd conference in Orlando in June. Shahed’s work on .NET development got him a free trip to Universal Studios, where he met his hero. 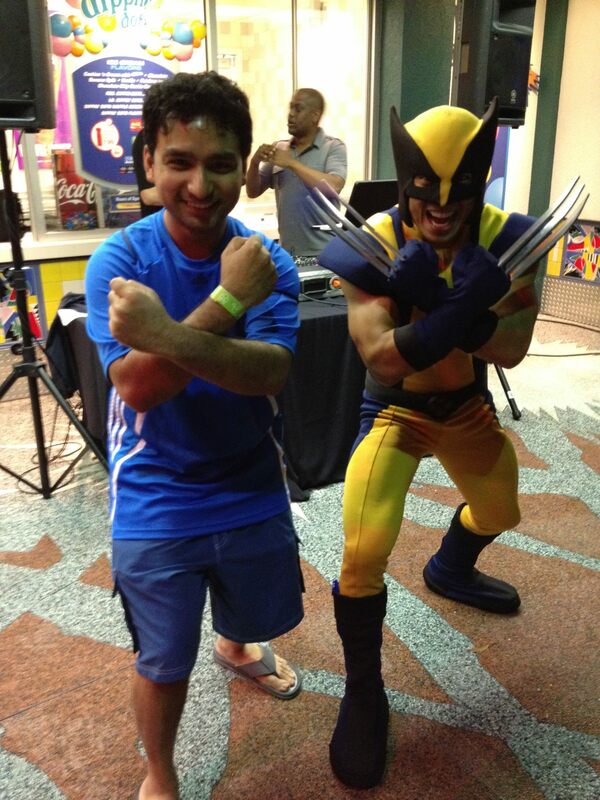 Immediately after this picture was taken, Wolverine cut his left leg off. Beyond dev tools, I’m also working on video tutorials (screencasts, if you will) for Indie developers. Going beyond the Xbox 360, I plan to develop games and tools for more Indie developers across more platforms. Not all projects will turn out the way you want them to. You may even have to put some projects to sleep when their time has run out. Cut your losses, and make the best of what you’ve completed so far. Corporate behemoths do this all the time, and so can you. Sega discontinued their Dreamcast hardware to focus on their software, when they realized that they couldn’t keep up with the competition in the console market. Google Labs (precursor to Google X) killed off projects periodically, if they didn’t amount to anything. In the same line of thinking, I started to build a new game this summer, with the intention of submitting it to Dream.Build.Play and the XNA Last Dance website. It was built on top of my very own Starter Kit, as a complete game which could also serve as a tech demo. But, when I realized that I couldn’t finish the game on time, I shelved it temporarily and focused on updating my Starter Kit instead. I had made some improvements to the Kit’s core engine while working on the game. So, I uploaded the latest version of my Kit to the OnekSoft Labs site. Finding your own success is not an easy feat. You may even discover that game development is not for you. Or you may realize that you need some formal education or real-life experience in game development before you can build something on your own. Take a look at top developers like DigitalDNA Games. From “Ask Angela!” to “Avatar Paintball” and the best-selling CastleMiner games, today’s success came from years of hard work. Even the Indie Gamer Chick had to start somewhere. From a no-name indie slayer, she has become the “most-read Xbox Live Indie Game critic in the world.” Don’t worry about trying to impress the critics. Do what you love, and be honest with yourself. If you think you can do better, just do it. Or not. Just make a decision and own that decision. Don’t go blaming the competition or the market for your results. Learn to adapt to any market, and you will be successful in your own right. This offers the middle ground, where you can release something, be proud of it, and learn from the experience. Very inspiring! It makes me want to start my next game right now. Unfortunately, I promised myself that I would not start my next game until my current project (non-XNA) is done and generating revenue. You made one very good point in this article. My C# skills increased dramatically while making Cuddle Bear. I would not be where I am at work if I had not made this game. And if I am ever in a hiring position, an XNA dev would be at the top of my list. Keep up the great work on your analyzer and I’m looking forward to using your starter kit. Thanks, Cuddle Bear! Best of luck in your projects! I am also planning on expanding my dev tools for other platforms, so I’d love to hear about your non-XNA project as well. I concur. I might just pull an all-nighter tonight with all of this inspiration.